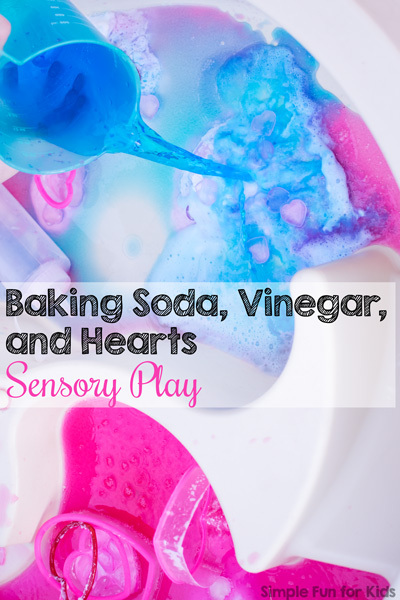 YES, it’s another awesome baking soda and vinegar activity! 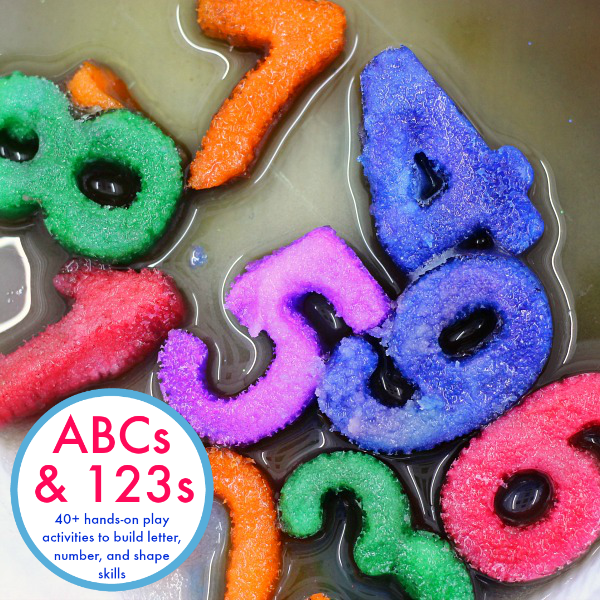 My kids enjoy these materials so so much each and every time, and they always put a different spin on it. 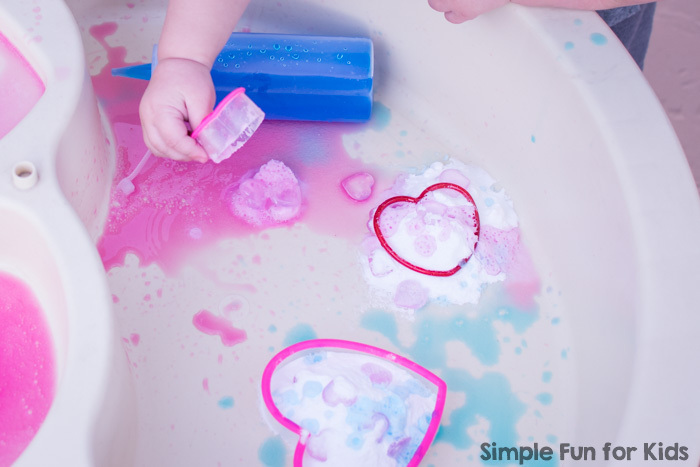 Both the toddler and the preschooler can interact with these materials in their own way, making them a great basis for fun sibling activities or play dates with kids of different ages. 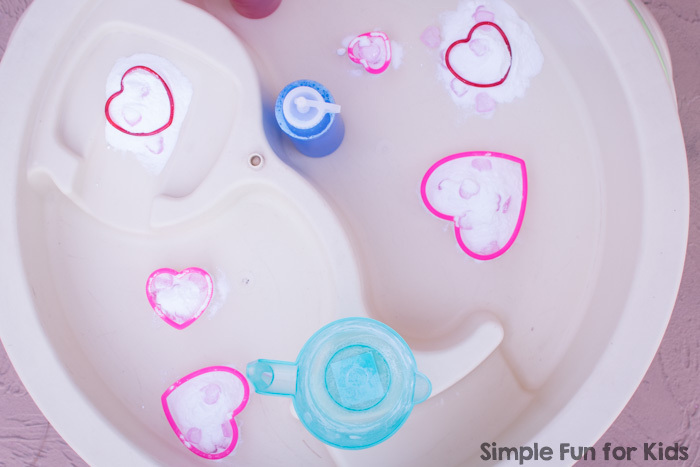 This time, my 1-year-old and my 5-year-old enjoyed some Valentine-themed Baking Soda, Vinegar, and Hearts Sensory Play in the water table! (N was 1 year and 7 months old. 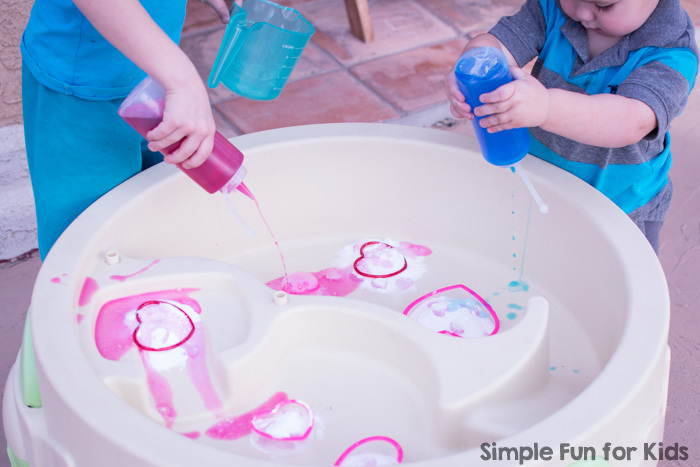 I chose to set up the materials in the water table. 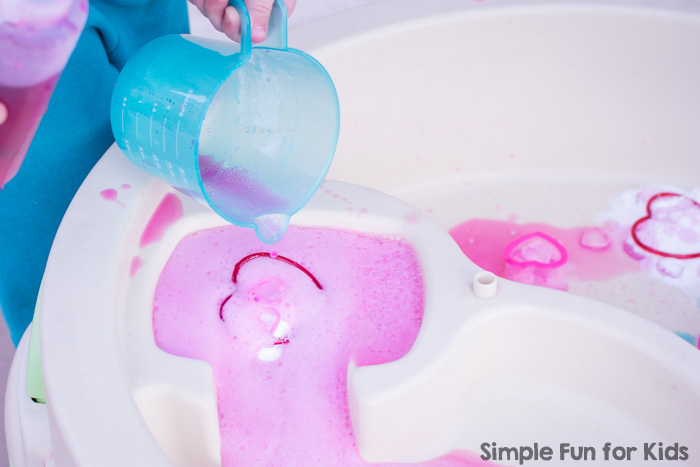 It works great for sibling activities for my toddler and preschooler, but you can absolutely do this activity in a low sensory bin or even on a cookie sheet, similar to how we did this Fizzy Easter Cookie Cutters activity. E dove right in and started squeezing red vinegar into the baking soda. N experimented with the blue vinegar and with how to get it to go where he wanted it to. 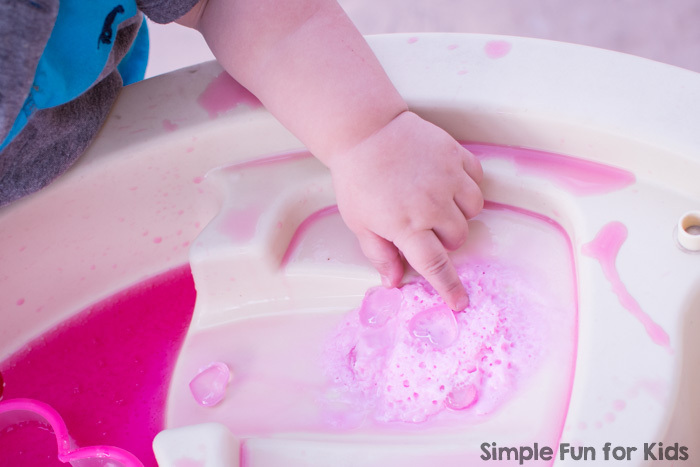 E quickly switched to squeezing the vinegar into the measuring cup and pouring it from the cup on the baking soda. 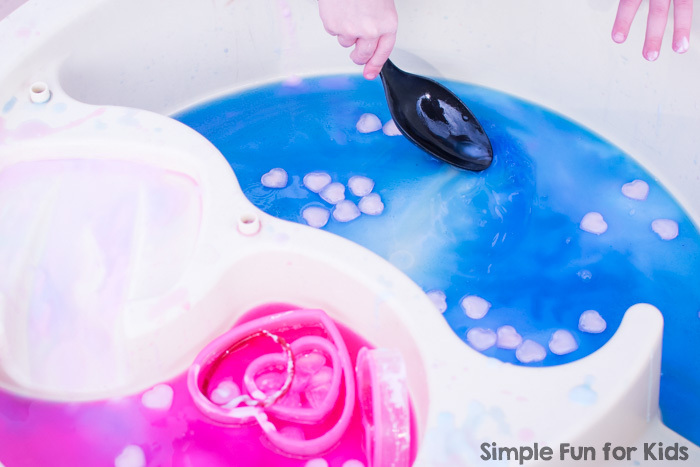 The chemical reaction was way more impressive this way! and the wet baking soda. 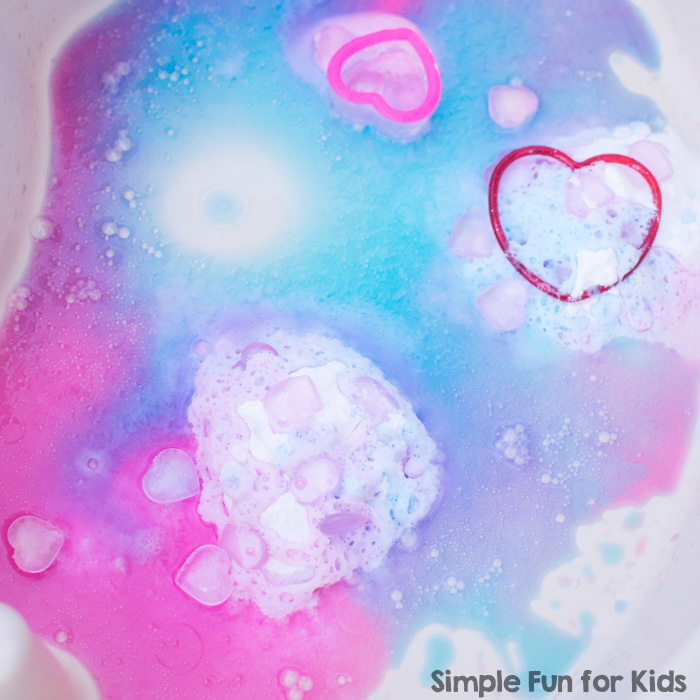 Together, E and N explored the baking soda further and realized that the colors hadn’t mixed, leaving some of the baking soda blue and some of it red in the same handful. 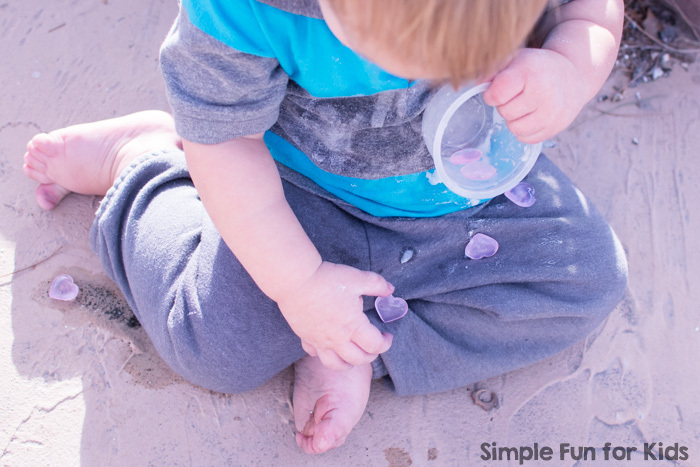 N ended up picking out some of the table scatter hearts, put them in a small cup that was lying around, and sat down a little ways away to play with the hearts. 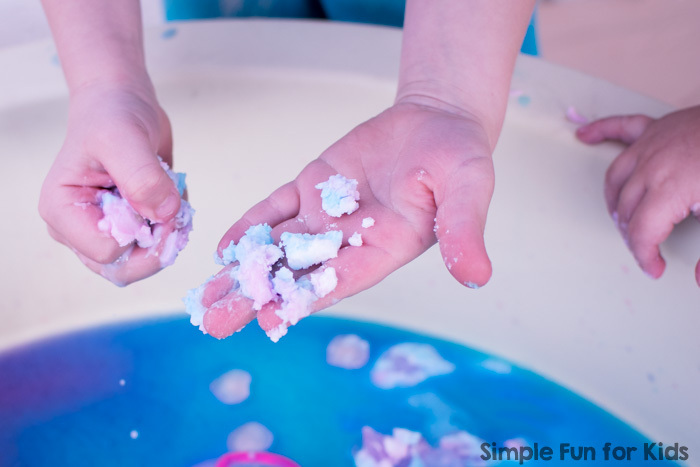 Here are some more awesome sensory activities for you! We use full-strength vinegar. I’ve never really thought about it, but I’d think that you could dilute it and still get a nice reaction. Let me know how it goes if you try!